ADL Heating & Air Conditioning keeps your family safe and comfortable, saves you money, and solves your HVAC problems with expert technicians and friendly and responsive customer service. ADL is a locally owned, family operated company serving Kankakee and Iroquois counties. ADL Heating & Cooling began in Kankakee in 2008. With a pickup truck and a 16-foot-trailer, Scott Lewis started the company, going to homes and small businesses to repair furnaces, install air conditioners, and help improve the comfort and function of homes around the area. In 2012, the business moved to Chebanse, Illinois. 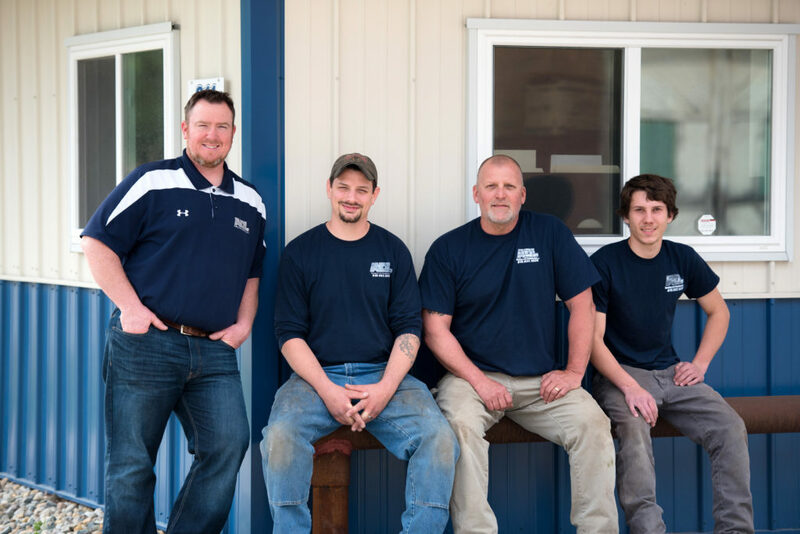 Our team has now grown to include a team of technicians who will treat your home like their own. "I'm passionate about helping you and your family. When entering your home, I treat it like my own, and won't leave until you're completely satisfied with the job our technicians and I have done." After spending 10 years learning the ins and outs of the HVAC industry, Scott Lewis founded ADL Heating & Air Conditioning in 2008. Even as the business continues to grow, Scott loves what he does more than ever and can often be seen at the end of an installation working with technicians to make sure the heater, air conditioner, or other systems are running as efficiently as possible. "I take great pride in the business we've been able to build, and the service we provide for our community." Bonnie, co-owner of ADL Heating & Air Conditioning, joined the company in 2009. Bonnie leads the customer service and marketing efforts of ADL, and helps make sure that each customer is treated like family. Bonnie is married to co-owner Scott Lewis and mother to their two beautiful daughters. Dave began learning about heating and air conditioning from his grandfather, Francis Coy, who had ran and operated Coy Heating from 1950 to 1979. As a 12 year old boy, Dave remembers learning to bend sheet metal and assisting his grandfather on some installations. Dave worked for his grandfather through highschool and later went to work for the next generation’s family business “Goodberlet Heating & Air Conditioning, Inc.”. While the Goodberlet family no longer owns the business, the Goodberlet name still carries a great deal of value in the Kankakee Area. Dave joined ADL Heating & Air Conditioning, Inc in the spring of 2014 when ADL was in search of a experienced service technician. Dave is known widely around the area for his fun loving personality and no nonsense approach to explaining an issue to a customer or simply giving his most honest and expert opinion or recommendation regarding any heating or cooling issue. We wont brag but Dave is probably one of the most knowledgeable guys in our area when it comes to boiler systems. Have a boiler issue? Dave is your guy! When not working Dave enjoys spending time with his wife Tonya, testing out his culinary skills on his smoker or working around the yard with the help from his four legged friends. Cameron joined ADL Heating & Air Conditioning, Inc. in the fall of 2016 and has quickly become a valuable asset to our team. As the youngest member of our team Cam’s ability to learn skills, wiring schematics, and the technical aspects of some of today’s very complex high end HVAC equipment is unrivaled. Cam has a sharp mind, great personality and a very hard work ethic that we know will take him far in his career in the HVAC field. When not working Cam enjoys working on his off-road Jeep Cherokee or his 1964 Ford F100. Mark joined our team in late 2017 and has quickly made himself a valuable part of the ADL Heating & Air Conditioning Team. Mark had previously worked in the HVAC field and his growing knowledge and experience in heating and air conditioning installation has more recently presented an opportunity for him to learn the sheet metal fabrication side of our business. He continues to excel in all areas of our industry whether it be HVAC system replacement, retrofit systems, or complete new construction HVAC installation. When not working Mark likes to spend his free time with his wife Tracy & two young sons. ADL Heating & Air Conditioning serves Kankakee and Iroquois counties, including Kankakee, Bradley, Bourbonnais, St. Anne, Aroma Park, Manteno, Momence, Bonfield, Herscher, Chebanse, Clifton, Ashkum, Danforth, Gilman, Martinton, Beaverville, Donovan, Crescent City, Onarga, and Limestone. For additional information or to get started, contact us today. Working For You, Loving What We Do. ADL Heating & Air Conditioning, Inc.